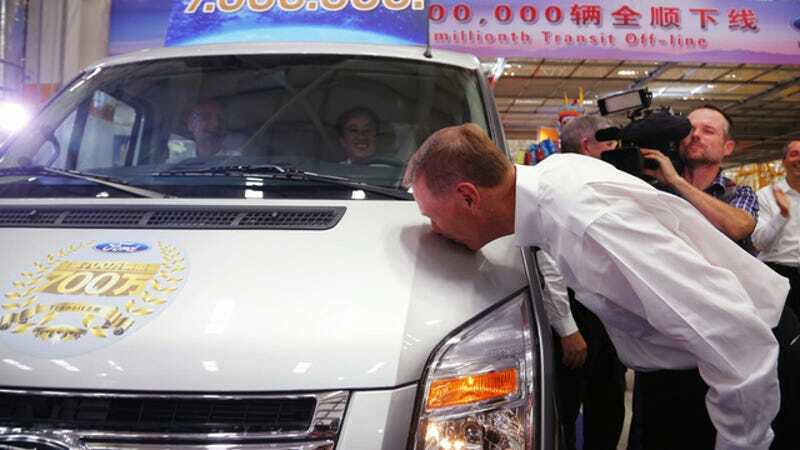 Noted mechaphiliac and Ford CEO Alan Mulally kisses the seven millionth Ford Transit Van to roll off assembly lines since production first started in 1953. Next year, production of the new generation Transit will begin in Ford's Kansas City plant as we Americans get to kiss the vanny goodness. I could find no examples of Mulally kissing a human being, although this one from his Boeing days comes close. Below, please include any photos you have of Ford's CEO kissing things and any theories as to what may be going on here.